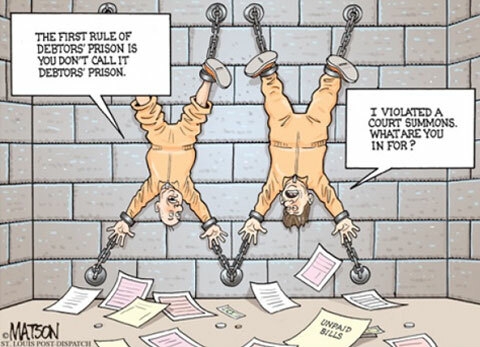 The United States criminal justice system is busting at the seams. We have over 7 million people under correctional control most of whose civil rights will been severely limited for the rest of their lives. 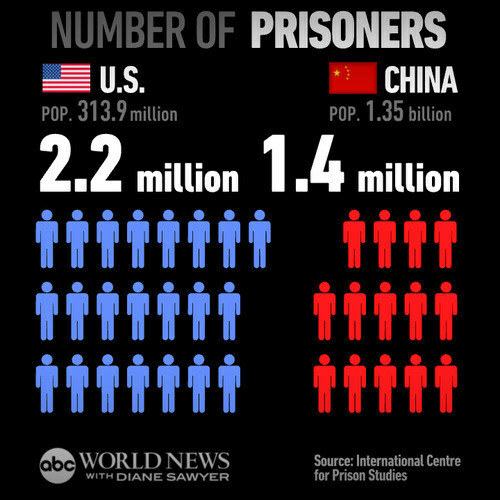 We have around 25% of the world’s prison population but only 5% of the world population and no room to put all of them. 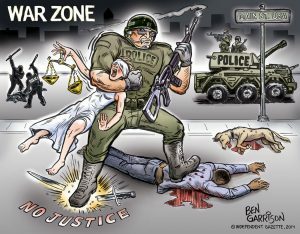 The rights guaranteed by the Bill of Rights are repeatedly bent and broken by the police in the name of law, order, and public safety. Large fines are handed out for small violations and when you can’t afford those fines you are sent jailed for your indigence. Non-violent and no victim crimes have been heavily criminalized and the police have extraordinary power to investigate and arrest these new “criminals.” The prison system itself cost billions around $39 billion according to some studies and an addition $25 billion just for the War on Drugs. America was founded on the principle that the government serves the people not charges them, that the government protects a fundamental set of rights not tramples on them. How did we fall so far? The start of the Drug War as we know it began under Nixon. Appealing to the silent majority he reversed previous administration’s policy of treating drug addiction as a mental health problem stemming from society failing them to a failure of personal responsibility. By changing the problem from a public health issue to a personal responsibility issue he was also able to target his detractors who also happened to use drugs namely the counterculture and minorities (specifically blacks). Any drug use became a failure of personal responsibility and as such was a danger to the American people that should be punished. The idea of using vices, particularly drug vices, specific to a certain group of people to punish that group wasn’t a new idea. In fact the 1875 Opium Den Act did the same thing to the Chinese and later the 1937 Marihuana Act did the same thing for blacks and Hispanics. However, Nixon armed with new crime fighting legislation, namely RICO and no-knock warrants, was able to wield federal power to suppress his opposition more effectively. He even consolidated his new drug fighters under one organization the newly minted DEA and used the new criminal forfeiture powers granted by RICO to give financial incentive to various other federal agencies such as the CIA to participate in the Drug War. Marijuana also despite the strong dissent of the Shafer commission he had himself tasked with investigating the dangers of marijuana was scheduled as a Schedule I drug. 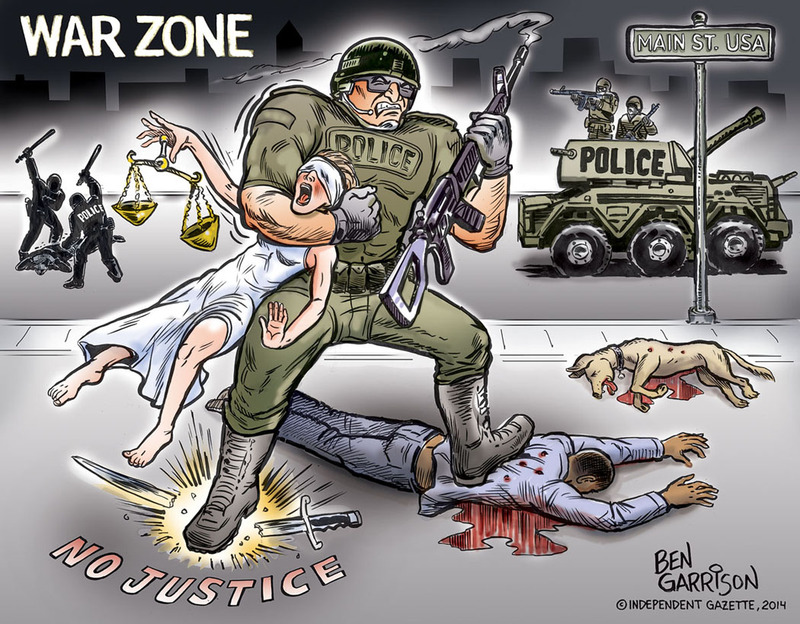 Furthermore, SWAT teams created to respond to extraordinary situations regular police aren’t trained to handled, as a response to the riots and violence of the 60s were being used for drug raids almost exclusively. However, despite all of this, other than a few raids and a moderate increase in money allocated to fighting the drug war, it was mostly inconsequential and only wielded for political and propaganda reasons. The War on Drugs hadn’t really started, but the framework was put into place. After Nixon as a result of Watergate and the election of Carter, the Drug War found little support, that all changed under Reagan. Reagan used the War on Drugs to support his agenda of trickle down economics by appealing to his base who believed that they were doing worse as a direct result of the welfare state siphoning money from them (the deserving) to support the poor and minorities (the undeserving). He used rhetoric such as the Welfare Queen to further take advantage of stereotypes and with thinly veiled prejudice declared his tough on crime policy that to this day continues to . The conservative court that had amassed as a result of numerous Republican appointees also shared in this tough on crime mentality. There court opinions virtually eliminated the 4th amendment protections such as the exclusionary rule by providing a good faith exception that declared that complying to police demands was consent and a “suspicious” person could be put under a “reasonable” search that included forced defecation. Adding to his weapons for the fight against crime, the Crime bill of 1984 added liberal civil forfeiture laws to his arsenal to complement the expanded criminal forfeiture laws. 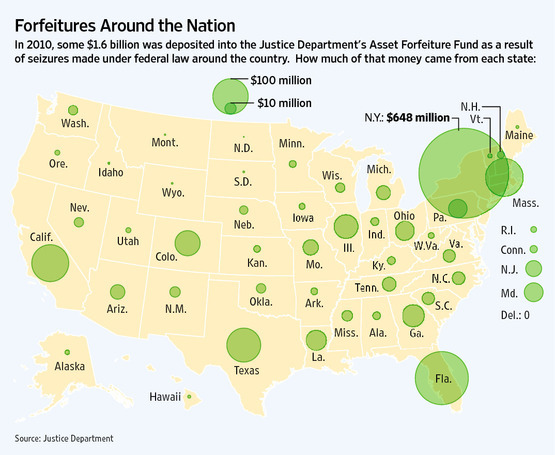 Before then civil forfeiture laws applied mostly to maritime law mostly in the cases of pirating and smuggling. Now it allowed the police to seize assets thought to be related to a crime without a conviction or even charging anyone of a crime. Furthermore Bush Sr., signed the National Defense Authorization Act of 1990 which allowed federal, state, and local policy agencies to acquire old military hardware to fight the drug war. The combination of this bill, the growth of SWAT teams, nationwide, and the use of SWAT teams on search warrants created a militarized police equipped to search your home for drugs unannounced and with military precision. 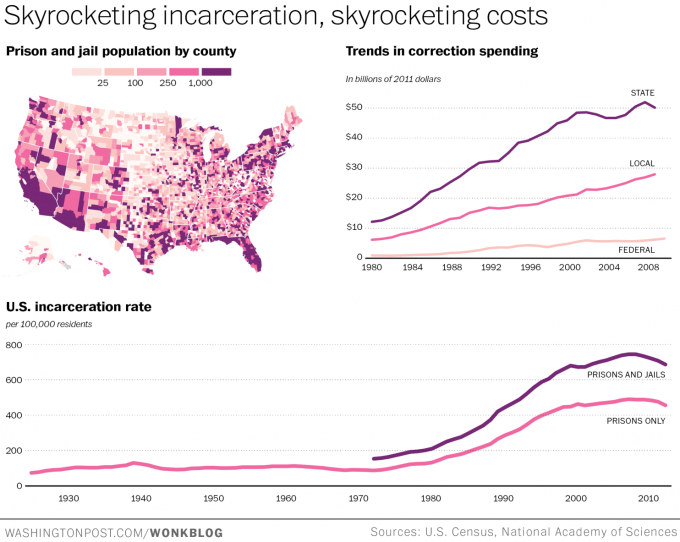 Mass incarceration followed this drastic reduction in civil rights, mass incarceration that affected exactly the groups it was intended to. By giving police the financial incentive to bring in drug money, the freedom to pursue drug money with little restrictions, and fueling natural prejudice by pushing further stereotypes against minorities resulted in black men from some municipalities having a 75% chance of being arrested throughout their lifetime. 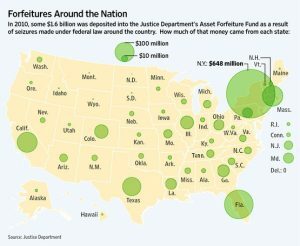 Furthermore, by giving prosecutors the financial incentive to convict drug cases, restricting civil rights to make it easier for prosecutors to bully mostly lawyer-less defendants, and by using mandatory minimums to shift power away from relatively impartial judges to severely compromised prosecutors these arrests turned into convictions and harsh ones at that. As a result county jails swelled with defendants awaiting trial sometimes for months, court budgets swelled as they needed more manpower to process these cases, and prisons grew as people were held there for extremely long sentences. Civil death has an interesting place in history, those branded civically dead were literally outside the law and as a result had no rights. 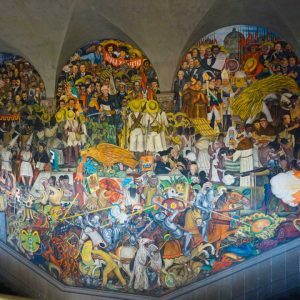 Historically, someone who was declared civically dead could hold no land, could sign no contracts, and even could be assaulted or even killed with impunity since they were no longer considered a person in the eyes of the law. As archaic as this concept may seem felons experience this to this day. 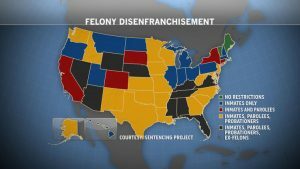 Criminal disenfranchisement and the exclusion of felons from juries has been used especially in the South to weaken the political power of minorities for over a century. When black’s civil rights were guaranteed as a result of the 14th and 15th amendment the South quickly had to come up with measures to weaken their influence on political affairs which of course culminated with Jim Crow. One of the first attempts was to criminalize poverty, enforce it solely against blacks, and then disenfranchise criminals preferably with a loophole for white criminals. Although, criminalizing poverty was frowned upon, felon disenfranchisement and the exclusion of felons from juries has remained on the books and is once again being used to weaken the political power of minorities. However, that wasn’t enough, drug felons face even tougher challenges, they are barred from most forms of public assistance including housing and food stamps, they are barred from educational grants, and like all felons they must check the box on employment applications that says felon; barring them from some jobs and significantly lowering their chances of getting any job. It is illegal to discriminate against minorities, but it is perfectly legal to harshly discriminate against criminals especially the “dreaded” drug criminal. It just so happens that drug criminals are overwhelmingly minorities. Michelle Alexander, author of the New Jim Crow, takes it a step further by stating this phenomenon was designed to put minorities, specifically blacks, into a new caste system and this egregious system is the civil right issue of our time. 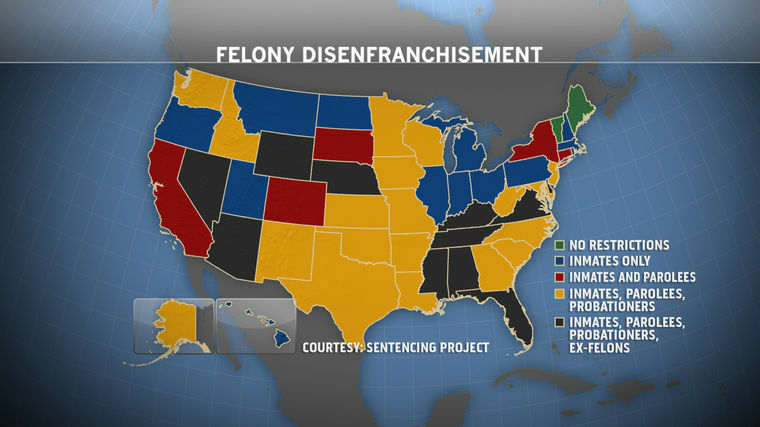 The disenfranchisement of criminals who are overwhelmingly minority has enormous implications not just for minorities who find themselves in a never ending circle of incarceration and lost opportunities, but for the country. The George W. Bush presidential elections were decided by a razor thin margin, if the millions of minorities who were disenfranchised voted, the election would have went another way. Civil death is the final nail in the coffin for the overwhelmingly poor and/or minority convicts. By taking away their ability to participate in any political and civil privileges their voice has been silenced. By removing the benefits they can receive to survive, the grants they can receive to train, and by giving employers the ammunition to legally discriminate against them they are being crippled economically. Felons are legally, socially, and economically made to be second class citizens there is simply on other way to look at it. Therefore it should come as no surprise the recidivism rate is 70% or higher for released felons and more than half are likely to go back to jail on a new crime in less than a year. How can one successfully reenter society when the punishment for their crime never ends? The Drug War mentality has infected police departments and small courts and has them searching for profit at the expense of some of its poorest residents and their basic civil rights. They have concocted fine and fee systems that have funded their departments at the expense of their most vulnerable citizens, they have contracted out collections to private outfits who impose their own fees with the backing of the law enforcement system, and they have used forfeiture laws not to prevent crime but rather to fund their own legal and police efforts. With the priority firmly placed in revenue generation rather than justice the people these courts and officers serve suffer. If any one has taken a road trip they are aware that some small city in the middle of nowhere has a speed trap. 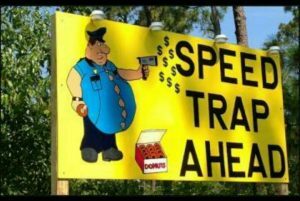 The speed limit is going to randomly drop down 10-15 mph or they will simply pull you over for going 0.5 mph higher than the speed limit. They will write you a $200+ ticket and send you on your way. Since you don’t really want to drive all the way back out to go to court to fight it you simply pay it. The court knows no one is going to fight the ticket and simply collects the revenue. Now imagine that you live in that small town or suburb and they fine you like they fine any foreigner traveling through the cities highways. However, their fines aren’t limited to speeding, they can be for just about anything from littering to illegal parking to public intoxication. 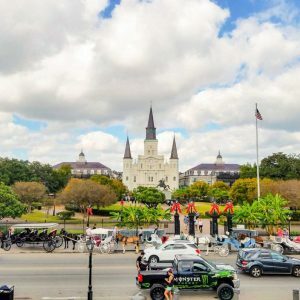 While a $200 fine might be a minor annoyance for a middle class family on a vacation it can be a devastating blow to a poor family who has to decide between paying a fine or food. However, if they want to fight the charge that comes with its own fees. There are fees for court usage, fees for the prosecutors time, fees to have a public defender, and etc. It can be more expensive to fight a charge then it would be simply to pay the fine, yet some of the poor struggle to pay their fines. It turns out being too poor to pay your fine is also a crime. Missouri became one of the first states to privatize the fine collection and probation system of their local government and the practice spread like wildfire. 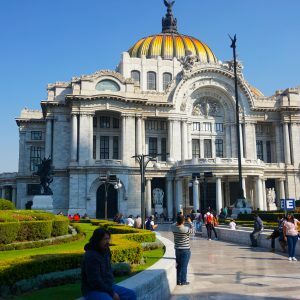 The private corporations are allowed to collect on the fine payments of the local governments citizens and charge interest and surcharges to the existing fines. When the resident becomes too indebted by the staggering compounding debt, the corporation will then turn to the city to jail the resident for failure to pay. This practice sometimes funds as high as 90% of a town’s revenue. Therefore, if you were slapped with a fine and get behind in the payment schedule (which also has a fee) of the fine than that initiates another fine and a warrant will be put out for your arrest. You can now be jailed for being poor and guess what the time you spend in jail also comes with a charge. Now you are caught in a never-ending loop. 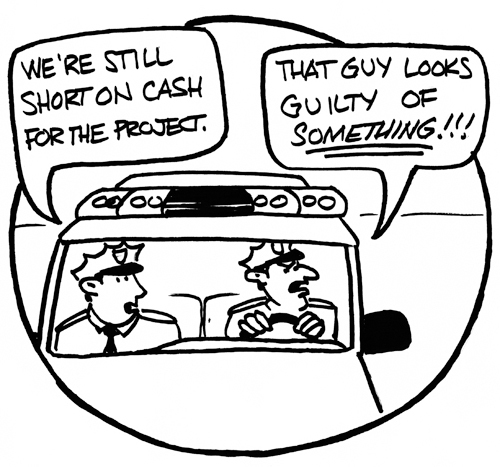 You can’t pay the first fine which creates another charge and a warrant for your arrest. Spending time in jail and the new charge add more money to your fine total which you couldn’t afford to pay when it was significantly cheaper and now you can’t work because you are in jail. It is near impossible to escape this debt to the state and as a result people go in and out of jail, not for violent crimes or even crimes that have a victim, but because of a debt to the state. Debtors prisons have returned. While local municipalities are seeing their coffers padded by the surge in fine money, public defenders have not seen an increase in their budgets. Public defenders are working case loads in the thousands sometimes having only 4 minutes to review a case, as a result the fundamental right to a lawyer is effectively denied to millions of citizens. Furthermore, thousands of citizens are kept in jail for long periods of time before their trial because they do not have the money to make bail. Most of those held on bail are there for minor crimes and pose little flight risk. In fact, holding people in jail because they can’t make bail is much more expensive than simply forgoing the bail costs. The wait times for a trial can be so long that people simply plead guilty to get out of jail, in fact even if the wait time for a trial isn’t long people will still plead guilty to leave jail because they cannot afford to spend even a relatively short time in jail. Children still need to be fed and a job is not forgiving to those who don’t show up because they have been arrested. 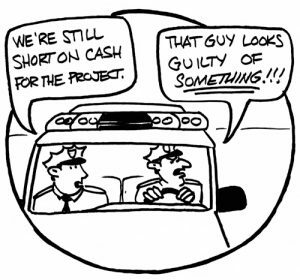 Nonetheless, pleading guilty leads to the various fines and surcharges that if you can’t pay sends you back to jail anyways, but with additional fines. The idea behind the criminal justice system and the Bill of Rights is that a person is innocent until proven guilty and as an innocent person they have certain rights that the government can not impede on without due process. Jailing people before their trial for poverty and forcing them to plead guilty to escape imprisonment without a trial is an affront to the Constitution. By having plenty of money for prosecutors, but no money for public defenders, who then proceed to give substandard advice due to time constraints, the people’s 6th amendment right to council is ignored. By setting the bail of poor citizens too high for them to afford their 8th amendment rights against excessive bail are infringed upon. By keeping the poor who cannot afford bail in jail for months or even if only for a few days their 6th amendment right to a quick and speedy trial is suppressed. 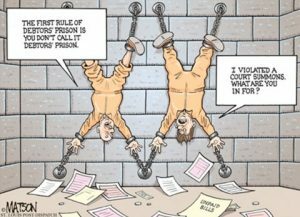 By imposing compounding fees and fines for their alleged crimes their 8th amendment rights against excessive fines are trampled on. Therefore, the most vulnerable and economically disadvantaged citizens are criminalized for their poverty and their meager wages are used to prop up the municipal courts and police departments that are supposed to serve them. Civil rights have been traded for revenue and justice pushed to the side for profit. The American promise has been struck down. Violent crime rates have decreased over the decades. Crime rates increased steadily from the 60s, until they peaked in early 90s, before dropping significantly and steadily since. Was the drug problem a major contribution to this violent crime increase and the corresponding Drug War the reason for its decline? If so, then perhaps the infringement of certain rights was a necessary sacrifice for safety and security. However, that is simply not the case, only around 10% of Americans use illicit drugs at any particular time and over 80% of those illicit drugs users use only marijuana which is almost never related to violent crime. Therefore only 2% of Americans or about 5 million people use illegal drugs other than marijuana and that has remained relatively constant since the 60s. 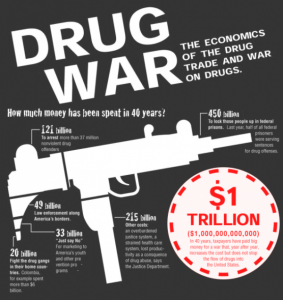 In fact, illegal drugs have become cheaper and more easily accessible since the advent of the war on drugs. Also, by heavily pursuing mostly low level drug dealers, drug violence has actually increased since the advent of the war on drugs. Other staples of the drug war such as mandatory minimums and the civil death of felons have been proven to have zero or detrimental effects on the crime rates. Longer sentences have been proven not to discourage crime and by regulating felons who have served their time to second class status it pushes them back into the criminal element. There have been many reasons speculating the fall in crime rates from the lower poor young male population due to abortion, the broken window strategy and some even as far fetched as lower lead levels, but all have more scientific facts and data supporting them than the drug war. Furthermore, the tactics of the drug war have penetrated municipal courts and local police. The federal government, by encouraging revenue gathering activities at the expense of citizen’s rights, has trickled down their drug fighting tactics to the local police and courts who have used every legal tool available to bolster their coffers. The “crimes” that allow them to siphon money from their own populous are petty by nature and as a result enforcing them with heavy economic consequences does little to nothing to serve the public good. However, it does cripple the citizens who are strangled by the system and builds resentment in the community for its government which festers and sometimes exploded into situations like the one in Ferguson. “Injustice anywhere, is a threat to justice everywhere.” Dr. Martin Luther King. Although the drug war disproportionately affects minorities, whites have also gotten caught up in it and their own municipalities have used these injustices as precedent and now benefit on the backs of their citizens both black and white. The United States criminal justice system needs to take a long look at itself and return to its original principles. The principles that every citizen has a Bill of Rights that no one can infringe upon, that we are innocent until proven guilty, and the government is to serve the citizens not to extract revenue from them. 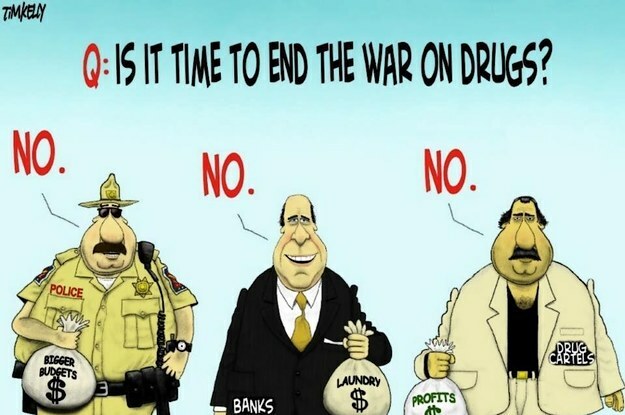 We need to end the drug war, demilitarize the police, regulate criminal forfeiture, remove the financial incentive for fining citizens or seizing assets by giving the money or assets to an unaffiliated party, eliminate excessive fines and surcharges for minor crimes, end privatization of the criminal justice system, ensure all defendants are economically able to meet bail or have a system in place that allows them to avoid jail before their trial, not keep citizens in jail for long periods of time before their trial forcing them to plead guilty to crimes they didn’t commit, and other measures to ensure that the Bill of Rights is not a suggestion but the law of the land. These two books allowed me to form most of my opinions related to the War on Drugs and also gave me incite in Supreme Court cases that have shaped the criminal justice environment we live in. I highly recommend reading both of these books Baum’s book for a view from the legal and historical perspective through a journalist lens and Alexander for the legal and historical perspective through a racial lens. Both have an interesting perspective that correlate with each other and provide interesting compliments of each other through two different views. Baum, Dan. Smoke and Mirrors: The War on Drugs and the Politics of Failure. Boston: Little, Brown, 1996. Print. Alexander, Michelle. 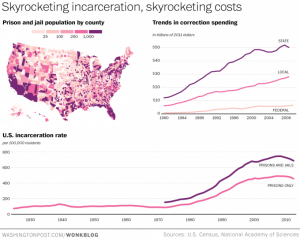 The New Jim Crow: Mass Incarceration in the Age of Colorblindness. New York: New Press, 2011. Print.